As I mentioned yesterday, I created two oil sketches as part of the process of producing my last commission. The works were based on images and ideas I had discussed with my client. When they were done to a medium point, I sent her images of the works and asked her to choose which one she wanted me to use as the basis for her final piece. She chose the piece I'll feature in an upcoming blog post. There were two reasons that I abandoned working on either of these oil sketches. I wanted to focus on making sure I did the work to complete her final piece. Also, I discovered that the brand of white I used that I got on sale (it was Bob Ross's Warm White) didn't dry enough to push past my original alla-prima (wet on wet style of painting) for months. At first I worried the problem was that I applied the paint too thickly (I used a painting knife to do the work). But after a short while, I realized something else was to blame -- that's when I figured out it was the paint. 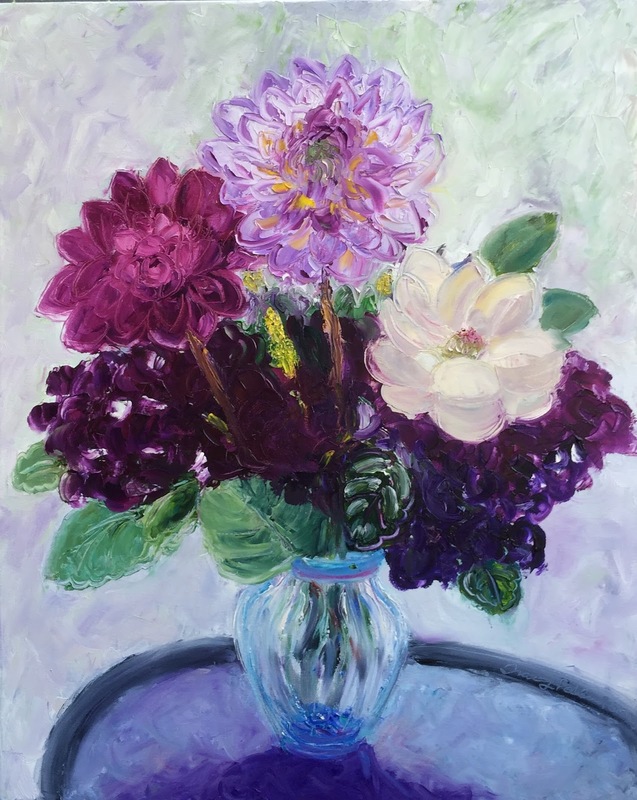 When the paint finally dried enough that I could work on the pieces again, I was able to make needed adjustments to Oil Sketch with Dahlias in Vase in the down times when the final commission was drying. Although the design wasn't chosen by my client for the final piece, I love the energy I was able to bring to the piece because I used a painting knife and let myself use a faster, looser painting style than I normally use. I also really like the formal style of the composition. It reminds me of a compositional style that an early impressionist might have chosen. And, it may seem a small thing, but I love the way I was able to suggest the stems in the vase. Because it's a sketch, on September the 4th, I'm putting it up for sale in my DailyPaintworks.com gallery, and I will be making it available for substantially less than I would a standard work on my site. Normally, I calculate the price to be $12.50 (w+h) (which means a 30 x 24" work would cost $675), but I'm going to make it available for half that -- $338.00 -- plus applicable tax and a nominal shipping fee. If you are interested in buying this piece, check it out in my gallery on dailypaintworks.com. Check out tomorrow's blog to see the other oil sketch I produced when working on my most recent commission. It's still a work in progress, and I'd love your input as I finally get down to finishing it! Yum ... Late Summer Veggies! Delivering the Commission -- Thank Goodness!